This very handsome, pre-war apartment building was converted from rental to residential condominium apartments in 2010. The building was designed in 1926 by Schwartz & Gross, one of the most active and distinguished high-rise, residential architectural firms in the early part of the 20th Century. Cetra/Ruddy was the architect for the conversion for the Sterling American Property Fund IV and the Atlas Capital Group. The fund bought the building in 2008 from Nostra Realty Corporation in July, 2008 for $83 million. The 15-story, red-brick building, which is also known as 301-311 West 101st Street, has a one-story limestone base, quoins and a cornice. The building has about 90 two- to four-bedroom apartments and a very large and impressive lobby. The building has a canopied entrance, a doorman, a children’s playroom, a live-in super, and a bicycle room, but no garage and no roof deck. Apartments have washers and dryers, central air-conditioning, beveled base moldings, crown moldings, Liebherr refrigerators, Bosch appliances, and limestone kitchen counters. Sterling, which is headed by Fred Wilpon, has been involved in numerous deals with Hines Interests and recently Sterling partnered with the Cheshire Group to convert the 12-story Devonshire apartment building designed by Emery Roth on the southeast corner of 10th Street and University Place. A New York state appeals court handed down a victory to Atlas Capital and Fred Wilpon's Sterling American Properties, "who challenged a lower court ruling that blocked an eviction at their 845 West End Avenue condominium conversion based on the landmark class action victory by tenants at Stuyvesant Town and Peter Cooper Village," according to a January 13, 2010 article by David Jones at therealdeal.com. The article said that "Jeffrey Turkel, a partner at Rosenberg & Estis, representing 845 West End, said that the decision represents the first time that the state appellate term has reviewed a case involving tenants trying to get out of a stipulation agreement based on the Stuy Town case, which was owned by Tishman Speyer. In the Stuy Town case, the landlord was found to have illegally deregulated apartments and overcharged tenants." Mr. Turkel said that the tenants agreed to vacate 845 West End Avenue, after consulting with lawyers, fully aware that the Stuy Town case was on appeal, the article said, noting that the 845 West End case "involved a couple named Ronald and Gwen Jannelli, who were paying $5,000 a month for a market-rate apartment until their lease ended in January 2008, when they became month-to-month tenants." "Atlas and Sterling bought the building in July 2008, with initial plans to convert the building into a condo, and notified the tenants in early February 2009 that they would not renew the couple's lease. The Jannellis reached an agreement to vacate the apartment by December 2009 and pay $5,200 a month from the expiration of their previous lease in so-called use-and-occupancy costs, in lieu of formal rent. But, the Stuy Town ruling was issued in March 2009, and weeks before they were scheduled to leave, the Jannellis filed suit to get out of their stipulation agreement, saying that their apartment should have been rent-stabilized. They tried to use the same argument successfully employed by thousands of tenants in the Stuy Town ruling," the article continued. 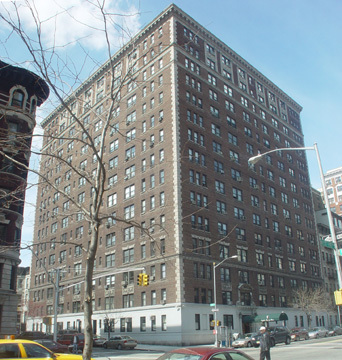 The lower court ruled in favor of the Jannelli family, noting that the building had received J-51 tax benefits and therefore the apartments should have been subject to rent stabilization, but the article said that "the appeals court ruled that the tenants presented no evidence that the new landlord committed fraud or that they entered into the stipulation deal based on some kind of mistake."